Many historic structures in North America were built at a time when metal fasteners were not readily available. Instead, wood members were joined by shaping the adjoining wood members to interlock with one another. Timber joinery is a traditional post and beam wood construction technique used to connect wood members without the use of metal fasteners. Timber joinery requires that the ends of timbers are carved out so that they fit together like puzzle pieces. The variations and configurations of wood-to-wood joints is quite large and complex. Some common wood-to-wood timber joints include mortise and tenon, dovetail, tying joint, scarf joint, bevelled shoulder joint, and lap joint. There are many variations and combinations of these and other types of timber joinery. 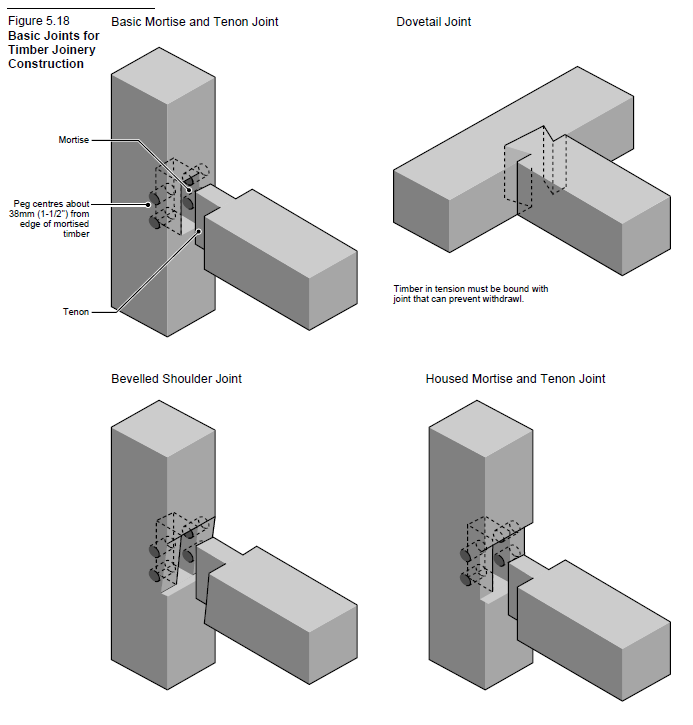 Refer to Figure 5.18, below, for some examples of timber joinery. For load transfer, timber joinery relies upon the interlocking of adjoining wood members. The mated joints are restrained by inserting wooden pegs into holes bored through the interlocked members. A hole about an inch in diameter is drilled right through the joint, and a wooden peg is pounded in to hold the joint together. Metal fasteners require only minimal removal of wood fibre in the area of the fasteners and therefore, the capacity of the system is often governed by the moderate sized wood members to carry horizontal and vertical loads. Timber joinery, on the contrary, requires the removal of a significant volume of wood fibre where joints occur. For this reason, the capacity of traditional timber joinery construction is usually governed by the connections and not by the capacity of the members themselves. To accommodate for the removal of wood fibre at the connection locations, member sizes of wood construction systems that employ timber joinery, such as post and beam construction, are often larger than wood construction systems that make use of metal fasteners. Wood engineering design standards in Canada do not provide specific load transfer information for timber joinery due to their sensitivity to workmanship and material quality. As a result, engineering design must be conservative, often resulting in larger member sizes. The amount of skill and time required for measuring, fitting, cutting, and trial assembly is far greater for timber joinery than for other types of wood construction. Therefore, it is not the most economical means of connecting the members of wood buildings. Timber joinery is not used where economy is the overriding design criteria. Instead, it is used to provide a unique structural appearance which portrays the natural beauty of wood without distraction. Timber joinery offers a unique visual appearance exhibiting a high degree of craftmanship.